Formalin fixed, paraffin embedded human breast cancer biopsy stained with Mouse anti Human estrogen receptor beta 2 antibody (MCA2279) followed by HRP polymer detection and DAB substrate development following heat mediated antigen retrieval using citrate buffer at pH6.2 (high power). Immunoexpression of ERs in endometrial cancers. Tissues were classified as well (A-D), moderately (E-H) or poorly (J-M) differentiated; main panels show closely adjacent sections from three cancer blocks to allow direct comparisons. All proteins were immunolocalised to cell nuclei (see higher power inserts in panels e, f, c and d respectively). In the well and moderately differentiated cancers expression was most intense in epithelial cell layers (arrowheads, panel A and inserts). Note that ERα was low/absent in poor grade cancers (J) but immunoexpression of ERβ1, 2, 5 was readily detected (K. L, M). Inserts in panels K, L, and M show negative controls for ERβ1, ERβ2 and ERβ5 antibodies respectively generated using primary antibodies pre-absorbed with specific peptides used for immunisation. Asterisks (*) label the stromal compartment that was well defined in the well differentiated cancers. From: Collins F, MacPherson S, Brown P, Bombail V, Williams AR, Anderson RA, Jabbour HN, Saunders PT. Expression of oestrogen receptors, ERalpha, ERbeta, and ERbeta variants, in endometrial cancers and evidence that prostaglandin F may play a role in regulating expression of ERalpha. BMC Cancer. 2009 Sep 16;9:330. 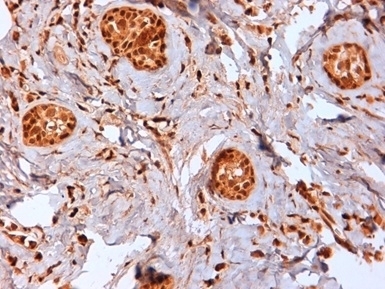 Mouse anti Human estrogen receptor β2 used for the detection of ERβ2 expressing cells in tumor tissue by immunohistochemistry in formalin fixed, paraffin embedded tissue sections. Effect of gender on ERβ1, ERβ2 and ERβ5 expression in D283 Med xenografts. 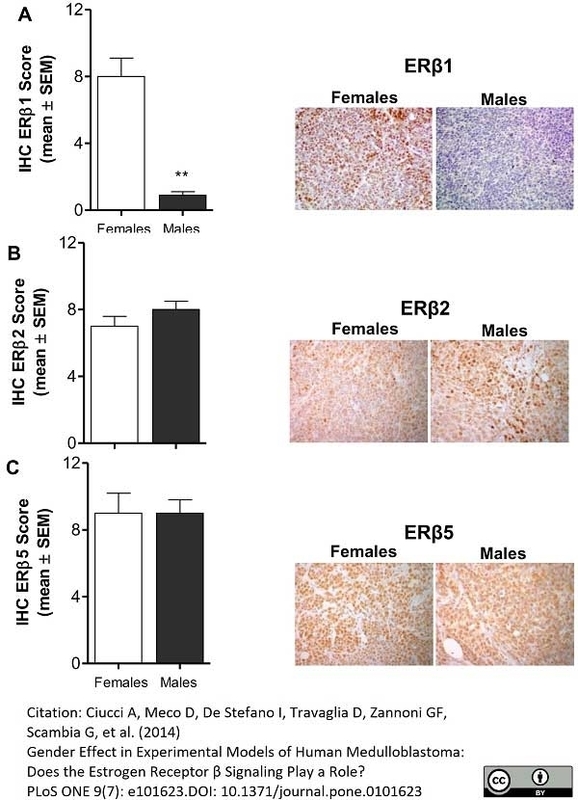 A) Immunostaining for ERβ1 was significantly higher in tumors from females compared to males (**p<0.01); B) and C) Tumor levels of ERβ2 and ERβ5 did not significantly differ between females and males. All results are expressed as the mean ± SEM (n = 6 tumors/group). 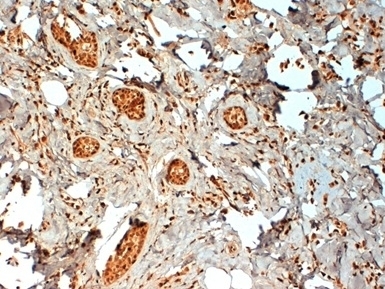 Representative stained section of tumors from females and males are shown (magnification 40x). IHC, immunohistochemical score. From: Ciucci A, Meco D, De Stefano I, Travaglia D, Zannoni GF, et al. (2014) Gender Effect in Experimental Models of Human Medulloblastoma: Does the Estrogen Receptor β Signaling Play a Role? PLoS ONE 9(7): e101623. Mouse anti Human estrogen receptor β2 (MCA2279) used for the detection of ERβ2 expressing cells in normal human liver by immunohistochemistry on formalin fixed, paraffin embedded tissue sections. Staining pattern of the ERβ isoforms in human liver. In order to confirm the specificity of the ERβ antibodies used in the study, we immunostained sections of human healthy liver, showing that ERβ1 and ERβ2 isoforms are not expressed, while specific nuclear ERβ5 immunoreactivity is detected (magnification 20x and 40x). This pattern of ERβ isoforms immunoreactivity is consistent with previous descriptions. Mouse anti Human Estrogen Receptor beta 2 antibody, clone 57/3 recognizes the estrogen receptor beta 2 isoform, expressed in cell nuclei of a range of human tissues including the ovary, placenta, testis and vas deferens. No cross-reactivity is seen with estrogen receptor beta 1 isoform. Synthetic peptide derived from the C terminus of the human estrogen receptor beta 2 isomer, CGMKMETLLPEATMEQ. Saunders, P.T. et al. (2002) ERbeta1 and the ERbeta2 splice variant (ERbetacx/beta2) are expressed in distinct cell populations in the adult human testis. J Clin Endocrinol Metab. 87 (6): 2706-15. Critchley, H.O. et al. (2002) Wild-type estrogen receptor (ERbeta1) and the splice variant (ERbetacx/beta2) are both expressed within the human endometrium throughout the normal menstrual cycle. J Clin Endocrinol Metab. 87 (11): 5265-73. Gaskell, T.L. et al. (2003) Differential expression of two estrogen receptor beta isoforms in the human fetal testis during the second trimester of pregnancy. J Clin Endocrinol Metab. 88 (1): 424-32. Scobie, G.A. et al. (2002) Human oestrogen receptors: differential expression of ER alpha and beta and the identification of ER beta variants. Wong, N.A. et al. (2005) ERbeta isoform expression in colorectal carcinoma: an in vivo and in vitro study of clinicopathological and molecular correlates. J Pathol. 207 (1): 53-60. Collins, F. et al. (2009) Expression of oestrogen receptors, ERalpha, ERbeta, and ERbeta variants, in endometrial cancers and evidence that prostaglandin F may play a role in regulating expression of ERalpha. Carpino, A. et al. (2007) Detection of aromatase and estrogen receptors (ERalpha, ERbeta1, ERbeta2) in human Leydig cell tumor. Eur J Endocrinol. 157 (2): 239-44. Miller, W.R. et al. (2006) Oestrogen receptor beta and neoadjuvant therapy with tamoxifen: prediction of response and effects of treatment. Br J Cancer. 94 (9): 1333-8. Rago, V. et al. 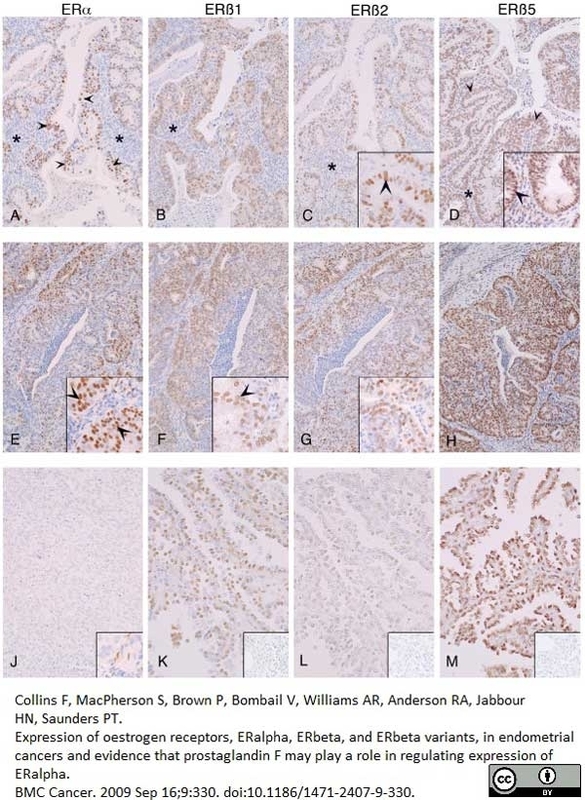 (2009) Identification of ERbeta1 and ERbeta2 in human seminoma, in embryonal carcinoma and in their adjacent intratubular germ cell neoplasia. Reprod Biol Endocrinol. 7: 56. Skliris, G.P. et al. (2006) Expression of oestrogen receptor-beta in oestrogen receptor-alpha negative human breast tumours. Br J Cancer. 95 (5): 616-26. Ciucci, A. et al. 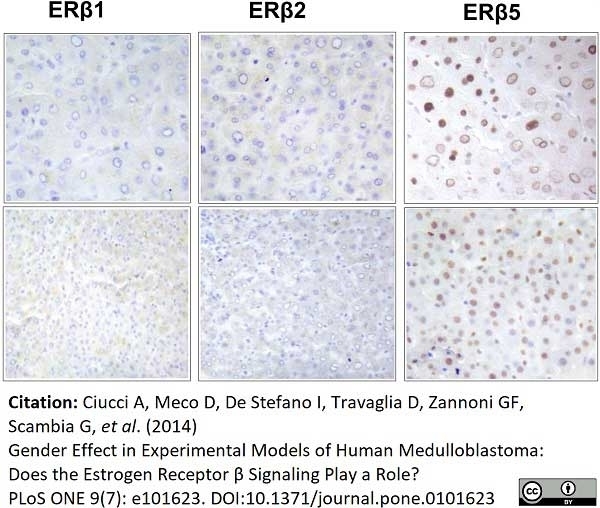 (2014) Gender effect in experimental models of human medulloblastoma: does the estrogen receptor β signaling play a role? PLoS One. 9 (7): e101623. Ciucci, A. et al. (2015) Mitochondrial estrogen receptor β2 drives antiapoptotic pathways in advanced serous ovarian cancer. Hum Pathol. 46 (8): 1138-46. Zannoni, G.F. et al. (2016) Sexual dimorphism in medulloblastoma features. Buttarelli, M. et al. (2017) Hormone receptor expression profile of low-grade serous ovarian cancers. Ciucci, A. et al. (2018) Estrogen receptor β: Potential target for therapy in adult granulosa cell tumors? Gynecol Oncol. 150 (1): 158-65.